Understanding the principles of how a lock works is the best place to learn how to pick a lock. We are going to talk about basic pin and tumbler locks in this article like the Kwikset and Schlage locks. 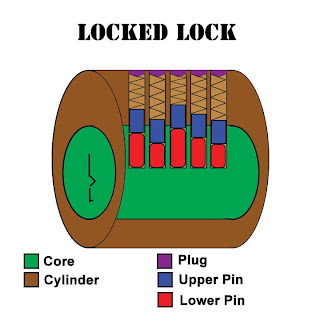 At its core a lock is a simple mechanism that consist of a core, cylinder, upper and lower pins springs and plugs. 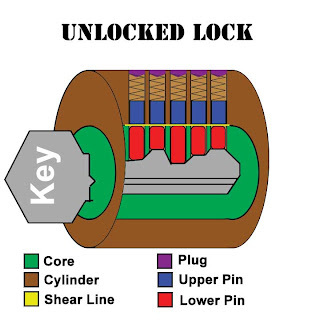 the basic concept of a lock is when the key is inserted into the lock it will line up the lower pins to the shear line allowing the lock to open where the shear line is the point where the core and the cylinder meet. knowing this basic knowledge gives us a better grasp on defeating the lock. In this Article we are going to discuss the rake lock pick method or lock scrubbing. This method of picking a lock is very simple in concept but takes a bit of practice to make it effective. Insert your tension wrench into the lock and apply slight turning pressure ( to get an idea of the amount of pressure to start with take a rubber band and put it on the end of your tension wrench and pull till the band is stretched about half and inch. ). Take a rake like the mp-11 or many others found on our site and insert the pick into the keyway as far as it will go without forcing the pick. Rapidly pull the rake out of the lock in a straight fluid motion do not let tension off the tension wrench. If the lock does not unlock after about 5-6 attempts reset the tention wrench and start the whole process over.